No one would ever accuse Las Vegas of dull visuals. Whether it’s the flashing neon signs of the casinos on the strip or the brilliant LED canopies on Fremont Street, almost every corner of Las Vegas is transformed at dusk into a virtual light show. But spectacular as all those lights may be, they definitely aren’t what you’d call energy-efficient. In fact, during the summer, it takes about 5,600 megawatts of energy per day to power Sin City. To give you a point of reference, that’s about as much energy consumed in one 24-hour period as 580 average-sized homes use in a year. If you’re familiar with the area, though, you know that a lot of that energy comes straight from hydroelectricity generated from the Hoover Dam—about 15 percent, to be precise. Much of the rest of that power comes from coal plants, fueled by reserves in Utah and Wyoming. But it would take over 4 million pounds of coal to meet Vegas’s power needs for one day. Luckily, city officials had already realized their consumption levels were a problem, and began implementing more sustainable energy programs back in 2008. And in December 2016, they were able to celebrate a huge milestone: with the completion of the large-scale solar farm Boulder Solar I, the city’s official buildings, streetlights, and facilities all run on 100 percent solar power. Next time you visit Las Vegas, unglue your eyes from the lights of the casinos and take a moment to appreciate the streetlights you pass—these aren’t just ordinary lamps, they’re 100 percent fueled by the sun. Thanks to an effort almost 10 years in the making, Vegas facilities rely on power coming from a large-scale solar power plant called Boulder Solar I. 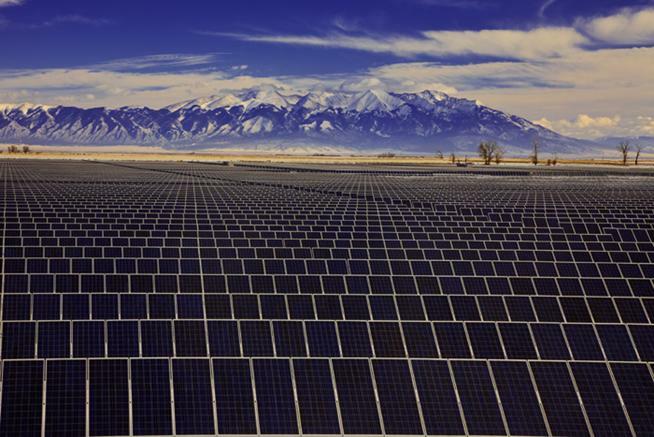 The plant was constructed by SunPower, a large-scale solar energy provider, and launched through a partnership with NVEnergy. It’s sized at 100 megawatts and generates enough energy to power 15,000 homes. SunPower estimated that it would offset around 192,000 tons of CO2 per year—which is like taking more than 740,000 cars off the road over the next 20 years. The plant sits alongside a second solar installation, Boulder Solar II, both located in the Eldorado Valley in Boulder City, Nevada, about 25 miles southwest of Las Vegas. Together, the two facilities make up a 150-megawatt solar array. Supplemental tree-shaped solar panels on City Hall plaza, combined with solar shade canopies in Las Vegas parks and from panels on the city’s wastewater treatment plant provide additional energy to power area facilities. That’s a pretty innovative use of space! Overall, energy efficiency efforts in the city have reduced energy use by more than 30 percent, a net savings of over 5 million dollars—not too shabby! With just over 600,000 residents, Vegas’s size makes it the largest US city yet to gamble on renewable energy. Their move follows in the footsteps of other jurisdictions, however—Burlington, Vermont and Aspen, Colorado are two notable regions that fuel city operations on 100 percent clean power. Vegas’s size—and its notoriety for high energy use—makes it especially auspicious when it comes to converting energy use. It’s a kind of “why not?” to other cities, as in, if they can do it in Vegas, why not here? Of course, Nevada is not short on sunlight by any measure. Las Vegas, in particular, has on average, around 300 sunny days per year. No wonder it’s ranked fifth in the nation for solar installations—the sun here is no joke! The new solar plant is welcome news to solar providers, many of whom have been embroiled in regulatory and legal battles this year. Solar advocates, regulatory agencies, and utility officials in Nevada have all been arguing over the state’s net metering rules, with a number of new rulings coming down from the State District Court. All in all, it’s been a white-knuckle year for many in the solar industry. Regardless of those challenges, solar is taking off across the nation—even in locales that are a little less sun-drenched. Last year, the Sierra Club counted 15 cities in the country that had either achieved 100 percent renewables or had made a definite commitment to move there in the next 20 years. City officials for these various metro areas cited a number of different reasons solar was on their radar: everything from environmental concerns to lower city overhead topped their lists. Ideally, this development will make Las Vegas a trendsetter in renewable energy, encouraging other larger urban areas to follow in their footsteps. What happens in Vegas may stay in Vegas—but in the case of solar energy, hopefully it won’t stay a secret for too long!